Multiplatform Swiss army knife to examine disks in great detail and fix problems with partition definitions and file systems. Create an exact clone or a compressed imagefile from your whole disk or a single partition. BROWSE through directories, and view or copy/recover files directly from the browser. 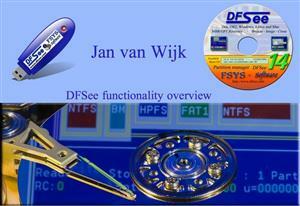 DFSee is a generic disk, partition and filesystem utility for maintenance and data-recovery. It supports partition-tables (FDISK, LVM) and filesystems like (V)FAT, FAT-32, EFAT, HPFS, NTFS, JFS, EXT2/3/4, HFS+, and some functionality for ReiserFS, XFS, SWAP and GRUB. As a replacement for the classic FDISK and (OS/2) LVM programs, with support for MBR as well as GPT style tables. DFSee is a complete replacement for the partitioning tools as found with DOS, OS/2, Win9x, Windows-NT/2000/XP/7/8/9/10 and Linux. It is also a replacement for the LVM utility that comes with eComStation, ArcaOS 5.x and all OS/2 versions 4.50 or newer. Only some obscure features like disk-spanning are not supported. Apart from the standard create/delete type of functions there are a lot of special commands to display information and fix all kinds of problems related to partition-tables and LVM information. A fully interactive partition-table editor is included as well (PTEdit), both for classic MBR-style partitiong as the more recent GPT (Guid Partition Tables). Finally, the FDISK functionality combined with the scripting capabilities is being used by large organisations for automatic (and unattended) roll-out scenarios. An often used function here is the DFSDISK command/menu-item/script that automate the collection of needed information to ‘UNDO’ an accidental FDISK operation or other partitioning related disasters. Another important feature is the ability to save and restore ALL partitioning information in a regular file that you can keep as a backup on a diskette so recovery operations will be MUCH easier. IMAGING Whole disks, partitions or parts of partition can be saved to an imagefile, either RAW or in a compressed format. The imagefiles can be restored to the same or a different location resulting in backup or copy functionality. The compressed images can be opened for directory/file browsing, to view or to retrieve individual files from such a backup image. This works for partition images as well as full-disk images. For large images, and using removable media to store them, it is possible to limit the size of the generated files and create multiple numbered files for one image. For direct writing to removable media like diskettes, CDR or DVD-R (streaming) it will prompt for media-change too. On the bootable CD, the bootimage uses an Ultra-DMA driver to allow maximum speeds on modern ultra-DMA IDE disks. For both imaging and cloning, DFSee can use internal allocation information from the filesystem structures to skip unused areas (SMART clone/image) minimizing imagesize and speeding up the process. As a minimal directory and file BROWSER, much like a filemanager. This is an easy to use and powerful way to access files in filesystems that may otherwise be inaccesible, either beacues there is some filesystem damage that prevents it from being ‘mounted’ in the normal way, or because you need to access it from an operating system that does NOT have a driver for this type of filesystem. Once in the browser, you can navigate through the directory structure and edit/view/copy one or more of the presented files. Copying files from the browser is a user-friendly way to RECOVER FILES from inaccessible filesystems, and can also be used in combination with undelete. This feature is implemented for FAT, HPFS, JFS and NTFS, but on those filesystems it is a very powerful tool. It is operated either using the user-friendly BROWSE interface, where you navigate to the files to be recovered, or by using the underlying commands directly for maximum flexibility abd effectiveness. It works by finding all deleted or normal files (DELFIND/FILEFIND), and then letting the user make a selection based on a wild-card filespecification and a recoverability outlook percentage (DELSHOW, or through the BROWSER). The actual recover operation will copy the matching files to a specified directory, if possible on another disk (RECOVER). You can find the file-recover and undelete functions in the menu as well, in the specific ‘Mode=…’ submenus for the filesystems that support it.